A Polish solitaire sailor- Szymon Kuczyński- is getting ready to sail around the world once again. This time, he is planning to accomplish this without making any stops at ports. Once again, he is facing this challenge on the Atlantic Puffin, a vessel, which is only 6,36 meters long. Maxus 22 is shorter than any yacht, that has circled the Earth so far, which sets Szymon’s goal extremely high. If he succeeds in doing so, Szymon will become yet another Pole , after Henryk Jaskuła and Tomasz Lewandowski, who will have achieved this goal (sailing around the Earth, passing the Three Penisulas). “Call of the Ocean” race is another one of Szymon’s expeditions. In 2013, he sailed back and forward across the Atlantic Ocean on his self-built, 5m long yacht, “Lilla My”. 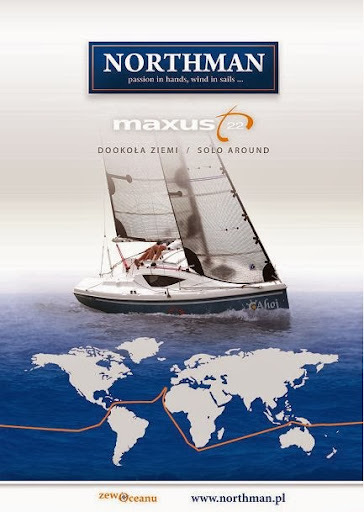 Also, in 2014, Szymon finished his round the world trip- “Maxus Solo Around”- taking the Pasat Route, but still, with making stops at some ports. This was also achieved on the Atlantic Puffin.The Puffin, which Szymon plans to sail once again around the World, was manufactured in the Northman shipyard. Maxus 22, which is normally used for in-land sailing and close-shore waters, has been adjusted for such and ocean challenge, by changing most of it’s construction. The hull and rigging have been strengthened and the interior of the yacht has been limited to the essential appliences. The cabin can be hermetically closed, and the hull can still remain floating on the water, even in case of an accident and a complete water flooding inside. Most of the innovative changes made in the Puffin, were based on the yacht class Mini – eg. There is an emergency evacuation look on the stern. You can say that in contemporary world sailing solo around the planet is no longer something outstanding. But it’s still one of the toughest challenges a man can take. Over 3600 people climbed Everest (37 Poles), over 300 managed to climb K2 (10 Poles). But only 270 sailors made it round the world – 15 were from Poland. Why so few? Common thinking is that sailing requires some secret knowledge and lot of money. So we want to prove that ocean sailing is affordable and available for a wider group of people. Maxus 22 (LOA 6,36m) is the smallest Polish yacht to sail around the globe – and one of the smallest in the fleet of those who completed the challenge. Maxus 22 construction and fitting; Boat is being built by our project Main Partner – Northmann Shipyard. [Technical data: LOA 6,36m / width 2,48m / sails 23 sq.m.] This boat was originally designed to sail on different waters – from inland through coastal to sea going on Baltic, Adriatic, Mediterranean or Bay of Biscay. Inside it hosts 3 people in coastal cruise, 2 in ocean sailing. Rigging and fittings are to be safely managed singlehanded. Speed record attempt for yachts under 6.45m (Górki Zachodnie – Swinoujscie, current record time of reference 83hrs 41 min). “Sailing Iceland 2014” project: Sailing from Poland through Denmark, Norway, Shetlands and Faroes to Iceland. Two small yachts and 3 persons involved. Szymon Kuczynski will sail onboard 5-metre-long “Lila My”. Dobrochna Nowak and Katarzyna Sałaban will take off onboard 6,36-metre-long Maxus 22. Crewed sail from Poland to Canaries. From mid-september 2014 to end of October we’ll visit the biggest sailing centers in Europe, like Nieuport, La Rochelle etc. In every marina a media meeting will be held as well as meetings with local sailors and communities. 5. Solo around the globe On November 10th 2014, Szymon will start his solo voyage around the world. His route will take him across Atlantic, Panama Channel, Pacific, Torres Straight, Indian Ocean, Cape of Good Hope and Atlantic back to Europe. This sail is to be completed by spring 2016. Setka is a project that comprises building a small, wooden yacht, sailing it in a cross-Atlantic race and back home, to Europe. It consists of four major stages and has been undertook by Dobrochna Nowak and Szymon Kuczyński. We want to prove that high seas sailing can be inexpensive and available to broad circles. As far as we know, it will be the smallest Polish sailboat to cover the route. Le projet consiste a construire un petit voilier en contreplaque de 5metres et realiser une regate transatlantique vers les Caraibes puis retour en Europe.Le projet SETKA (type de construction) se compose en quatre etapes principales.Participent au projet : Dobrochna Nowak et Simon Kuczynski. Szymon jest już oficjalnie zgłoszony do tegorocznej edycji Single and Double Handed Polonez Cup Race. Impreza odbędzie się w Świnoujściu w dniach 10-17.08.2013. This tale is intriguing - and the photo library especially so - as I am preparing a sailboat for singlehanded sailing, out of Plymouth, England. My club hosts the Start of the jester Atlantic Challenge ( and the Azores, and Baltimore, Challenges ) so I have plenty of examples to provide me with good ideas.... like your photos.